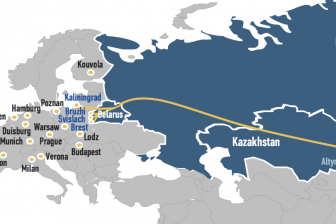 A new rail freight service between the Latvian capital Riga and Xi’an in China was launched. The container train from Xi’an International Trade & Logistics Park arrived for the first time at the port of Riga on 16 November. At the port of Riga, some containers are loaded onto vessels for delivery to German and Finnish ports. The arrival of the new train from Xi’an coincided with the delivery of 264 containers from the port of Rotterdam for rail shipment to China. According to Latvian Railways, it is the first time that the interchange of freight trains to and from China took place at the Riga port area. The Xi’an-Riga service was organised by Latvian Railways together with Belarusian Railway. 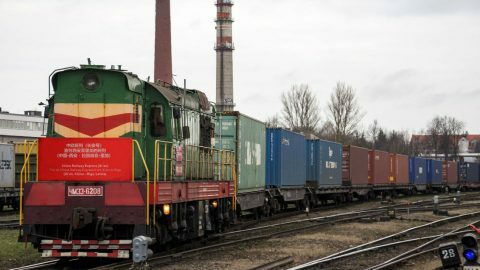 It follows the route of the Minsk-Riga freight express train, launched by their logistics subsidiaries -LDZ Loģistika and Belintertrans- in February. “Partners have appreciated our services and abilities, successfully justifying the confidence in us.With the freight express train Minsk-Riga, we have, together with Belarusian Railways, successfully tested the long-distance transportation of containers. This train ran through Latvian territory in only twelve hours”, said the chairman of Latvian Railways Edvīns Bērziņš. 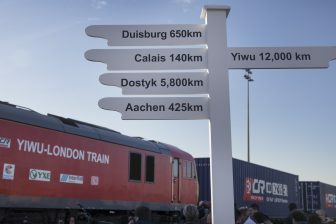 Latvia made the first attempt to establish a rail freight link with China in October 2016, when the pilot Yiwu-Riga container train was launched. The trial service was organised by LDZ Loģistika, TransContainer and several Chinese partners. The train made the 11,066-kilometre journey from China to Latvia via Russia in twelve, importing textiles, bathroom equipment and household goods. However, the service did not become regular. A new container train was launched between China and Latvia in May 2017. It linked Kashgar and Urumqi with Riga via the territory of Kazakhstan and Russia on a regular basis. The service was organised by LDZ Loģistika, TransContainer and Gefco Baltic. The equipment for the textile industry was delivered to Riga from Duisburg by sea. In October 2017 the end destinations of the route were changed. The train started to depart from Urumqi in China, and containers were handled at the port of Riga for delivery by vessels to the port of Rotterdam. In theory this lane seems fine, in practice it is not. The transit time is even longer than the current lane with some hick ups in Mala. This lane has been tested and the outcome is that the transit time via this routing is much longer than the current routing via Mala. Even including the sometimes appeared delays over there.